Steven Spielberg has always been a fan of history and science-fiction. Often the master director will release a big-budget science-fiction blockbuster and a profound historical drama within the same year. 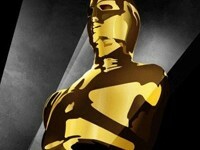 We’ve seen this in 1993 when Jurassic Park dominated the box office and Schindler’s List lifted a Best Picture Oscar. In 1997 he returned with the Jurassic Park sequel and the overlooked slave drama Amistad. In 2005 he unleashed Tom Cruise’s greatest worldwide hit War of the Worlds and followed it up with the Oscar-nominated Munich come awards season. Within a matter of days Spielberg has managed to deliver his first animated film The Adventures of Tintin, an action-adventure closely mirroring Raiders of the Lost Ark, and he now aspires to melt icy hearts with the overtly sentimental War Horse, a World War I drama seen through the eyes of a horse sent off to fight for both the English and Germany. Set on the eve of WWI, War Horse tells the tale of Joey, a young horse purchased at an auction by Ted Narracott. Ted is a drunken war veteran and owner of a farm on the verge of financial collapse. The survival of the farm depends on Joey learning to plow. 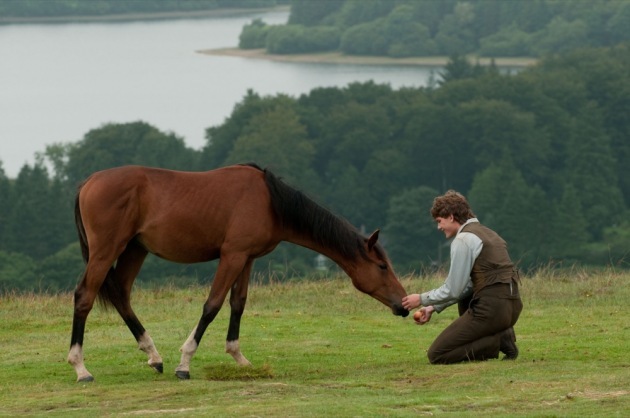 Ted’s teenage son, Albert (Jeremy Irvine), develops an instant bond with Joey, and he becomes determined to train the young steed to plow for harvest season. That determination unsurprisingly pays off until a rainstorm floods the entire field of crops and leaves the Narracott family unable to make ends meet. Ted sells off Joey to an English regiment officer (Tom Hiddleston) about to leave for war. Albert flips out, chasing Joey down and pleading for his companion back. Unable to sway the genuine soldier, Albert promises Joey they will be reunited. The horse heads off to war and survives a massacre after an intercepting German fleet overruns the ill-advised English troupe. Joey becomes German property and ultimately finds his way into the hearts of every man overseeing him. The story has Joey entering and exiting the lives of several different individuals, each drawn to the animal’s power, understanding, and gumption. From young boy soldiers, to French civilians, to artillery gunmen, Joey persists in survival. The story eventually returns to Albert having finally entered the war years after we first met him. We know at some point the story will in fact reunite Joey and Albert, but the journey in getting there is simultaneously beautiful and obtuse. Spielberg has over-fattened the calf with a 2 and 1/2 hour epic that wastes too much time on thinly drawn characters. Despite well-intentioned performances from an extended cast, War Horse strays too far from Albert before sticking him back in the thick of the plot. Joey dominates the proceedings while the humans fade into the background. The horse being constantly intercepted by a new set of characters only hinders the film because those small side stories never amount to anything substantial. Since the film is built entirely on coincidence, such as the fact that Joey never encounters a ruthless overseer in his WWI experience, the film falls victim to too much sappiness. The characters, the writing, the dialogue – all of it bathed in soapy sentimental hogwash where scenes exist and speeches are made to simply extract tears from the viewer. There’s no authenticity behind it. Spielberg has walked this territory before, such as Hook and Always, but never masking it as earnest sincerity. Even though War Horse stalls, it is more a dramatic miscalculation than a complete mess. 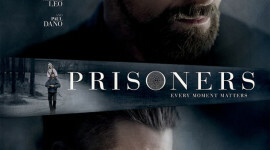 When a movie attempts to manufacture emotion rather than draw it out naturally through well-written characters, I tend to immediately disconnect from the narrative. However, Spielberg’s film still creates lasting imagery that imprints on your mind and sticks with you despite all of the faults. The film boasts an involving musical score and amazing cinematography. The combat sequences aren’t shortchanged for all the heart-melting. A particularly memorable sequence has Joey leaping through an open battlefield, fleeing over trenches of men and nearly escaping before slamming into a heaping of barbed wire. If prestigious award ceremonies gave out nominations for memorable scenes, War Horse would bring in a few nods. And what about the horse Joey? After all he’s the main character of the story. Really, this isn’t Albert’s story. This is Joey’s. I’ve heard reports indicating that 8 or so horses were used to portray the character. It’s a marvelous effort. 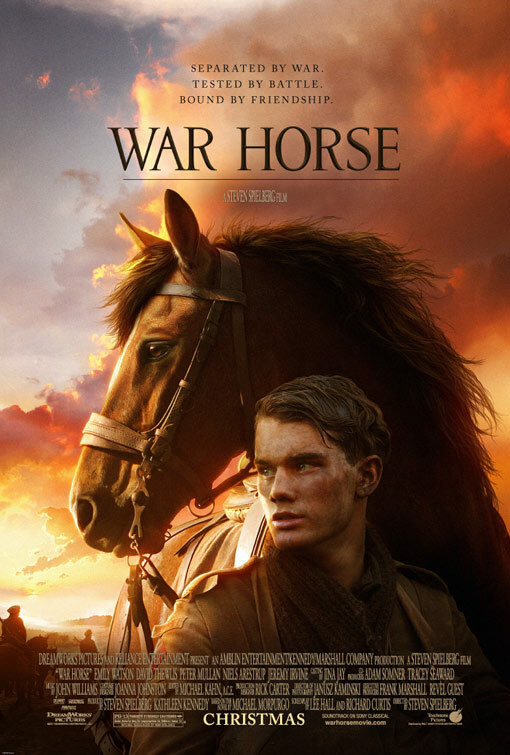 Joey comes to life and really delivers as the hero of War Horse, portraying just as much emotion as his human counterparts. That in and of itself makes War Horse a small miracle worth checking out. I think many people will overlook the flaws here and end up loving this movie. I also think many people, like me, will be turned off by how schmaltzy it is. This isn’t just a tip of the hat to old school filmmaking. I can appreciate that as much as the next film lover. The problem is that War Horse boasts a level of schmaltz that detracts from the story. Spielberg keeps it from being a colossal failure. His attempts are genuine, but the story is convoluted. Upon understanding that the source material for the film is a children’s story, I can understand why. For a gorgeous film that’s minor-Spielberg, a man from which we are burdened with great expectations for, War Horse is both a major and minor disappointment.